The Supreme Court ruled Thursday that the strip search of a 13-year-old student violated the constitutional protection against unreasonable search and seizure. The court ruled 8-1 that Arizona school officials violated Savana Redding's Fourth Amendment rights when they searched her down to her bra and underpants. Officials were looking for pain relievers, which they didn't find. s the Obama administration ramps up the Drug Enforcement Administration's presence in Afghanistan, some special-agent pilots contend that they're being illegally forced to go to a combat zone, while others who've volunteered say they're not being properly equipped. In interviews with McClatchy, more than a dozen DEA agents describe a badly managed system in which some pilots have been sent to Afghanistan under duress or as punishment for bucking their superiors. The new regulations, which come as the District continues to grapple with last year's Supreme Court decision that threw out the city's gun ban, will allow residents to legally obtain at least 1,000 additional types and models of handguns. City leaders sought to play down the effects of the new regulations, but gun rights advocates said they were another boost to their efforts to undo the District's long-held restrictions on personal possession of weapons. And what they didn't bother to mention in that story?...Amongst other things, the fact that Jacoby and Young Political Majors were hired by the California Republican Party to head up their voter registration efforts in the state. 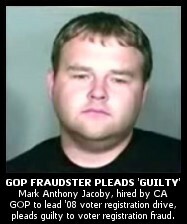 Jacoby had been arrested for Voter Registration Fraud last October, smack dab during the media's orgasmic heights of last year's phony GOP ACORN "Voter Fraud" hoax, even as Fox "News" (and the other news outlets who similarly fell for the scam) were going wall-to-wall with their unsupported insinuations about voter fraud by ACORN, Democrats and Obama. Our news media, with the help of our government, have been constantly focusing on their careless associates messing around in Iran and Korea while innocent people arrested on false charges right here in our own country are ignored. Our government is no different from any other when it comes to arresting people on false charges. Our biased, slanted news media give their stamp of approval with little regard for political prisoners unless one of their own winds up behind bars. 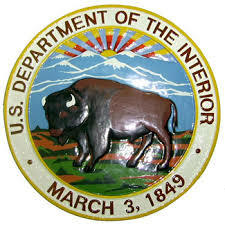 A new report from the Department of the Interior says that Bush administration officials did not follow longstanding practices when they auctioned off 77 parcels of Utah land for oil and gas drilling while keeping the National Park Service in the dark about potential drilling near park land.